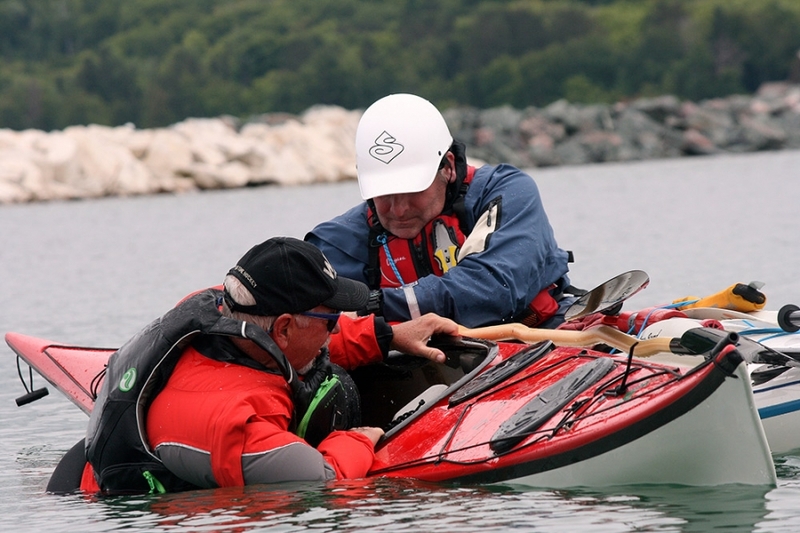 Over the past year and a half, the Sea Kayak Program Development Committee has undertaken a comprehensive review of the sea kayak program. Following is an update on our current status. In the summer of 2016 we requested feedback from the membership on our proposed changes to the sea kayaking program. After the consultation period ended, we reviewed the comments and completed a draft of the sea kayaking skills manual. The manual is now available for review and we are interested in receiving your feedback. You can download a copy of it here. We received feedback early on that elements of the program were vague and sometimes confusing as to what exactly students need to accomplish. To fix this problem every stroke or theory item now has specific statements about what the student is expected to do or know. There is now a new teacher’s notes section for most skills providing more direction for the instructor. We switched to a new water classification system that’s currently in use with several other paddling associations and government organizations including the BC Sea Kayak Guides Alliance, National Parks and the Canadian Coast Guard. The new classification system is more holistic and takes into account additional elements other than just wind speed and wave height. You can find the specific descriptions in Appendix A of the draft skills manual. On a whole, Basic Kayak is much leaner. We received feedback that there was too much material to cover making the day feel rushed for students so we cut back on the number of theory topics. Level-2 skills has been extensively redesigned with the removal of campcraft skills and making an overnight an optional activity. New to this program is a stronger emphasis on level-2 paddlers being prepared for a possible emergency overnight out. Students will now be required to demonstrate the setup of emergency shelters and come prepared with the necessary gear for a possible overnight. There is now greater direction for some skills to be assessed with loaded kayaks. You can find specific information about this in the draft skills manual. In Level-3 the leadership and decision making element has been extensively reworked with clear direction and learning outcomes. This was identified early on in the review process as a major issue to address. We are keen to hear from instructors who teach this level if you think we got it right. Like Level-2, Level-4 has also undergone extensive reworking. The PDC has reaffirmed it’s belief that Level-4 is about paddling in class-4 conditions along remote and exposed open coast on an extended trip. It isn’t intended to primarily be a current or surf course. While those skills are still an element of the course, the emphasis is about paddling in all those environments while on an extended trip or expedition. The Level-4 description has been expanded to more accurately depict the intent of the program. We acknowledge students on the course come with a wealth of knowledge and strong foundational skills so to this end, the delivery of this program should focus on group problem solving through extended use of scenarios and effective debriefing after the fact. This switch in focus more accurately reflects current practice and allows instructors to better adapt to the students specific needs and challenge them accordingly. Emphasizing this approach, we hope to address one of the chief complaints which was that students felt they were repeating the same skills and activities from Level 2 & 3. More information regarding this change can be found in the draft skills manual. We adjusted the lexicon throughout the entire program from “rescue skills” to “re-entry skills”. This brings a more positive focus on the activity and better describes what students are actually doing. And finally, we significantly expanded our appendices at the end of the manual which we are very proud of. We wanted to provide more resources for further learning for topics like leadership, risk assessment, environment, etc. We are always looking for more resources to include so please contact us with your ideas. As you are reading through the new program you will notice that we are missing the instructor and instructor trainer streams. They are currently being written and we hope to have a draft out for comments towards the end of the summer. End of summer: Draft instructor and (hopefully) Instructor Trainer streams released for feedback. Fall, 2017: Final version of skills stream and instructor streams released, new training conference calls organized. January, 2018: New program released. While the draft manual still needs to go to an editor to clean-up our grammar mistakes, we want to hear what you think of the new program. Specifically, is there anywhere that we missed the mark or how can we improve the way that we word items. You had better hurry though, the deadline for comments is March 31. The draft program manual can be found here.